The Mac Preview app has long included the ability to digitally sign documents with a signature, but up until the most recent versions of Mac OS X, users had to basically sign a piece of paper and then use the Macs front-facing camera to ‘scan’ and digitize the signature. 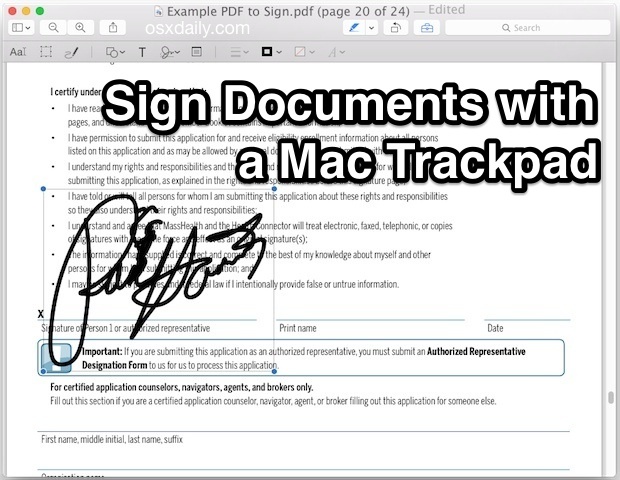 That has changed with modern releases of Mac OS, and if your Mac is running Sierra, El Capitan, Yosemite, or newer, you can now sign documents using just a trackpad. The trackpad signature feature of Preview is very easy to use though it remains a little hidden and isn’t necessarily obvious if you don’t know where to find it. Nonetheless, Previews signature tools are s so useful and make signing forms, contracts, and any other documents so easy, that all Mac users absolutely must know how to use it. 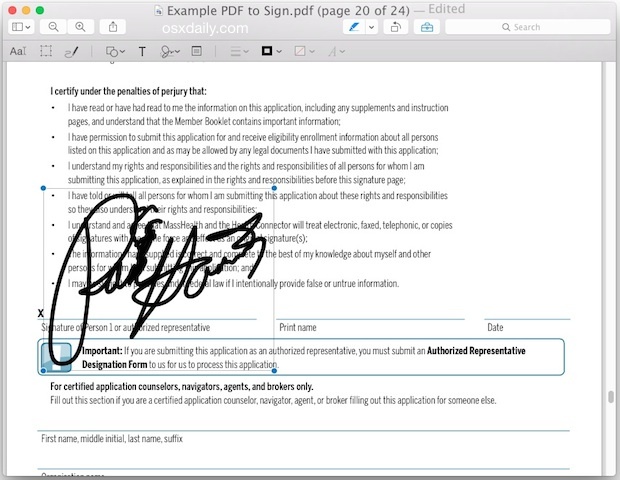 In this example we’re going to be signing a PDF file, but you can apply the signatures to literally any file that will open within Preview app. With your file saved, you can email the signed document, upload it through a web form, whatever else is necessary. The signature you created with the trackpad gets saved into Preview app, so you can quickly access it again in the future to sign a document just by selecting it from the Signature button. Unless you want to use a new or different signature, you don’t need to go through the creation steps again. This trackpad method is really the simplest and quickest way to sign something on your Mac, and it works with any trackpad, be it the Magic Trackpad or one built into a MacBook Air or MacBook Pro. Let’s hope a similar feature comes to the iPhone and iPad too. Remember that it wasn’t terribly long ago that if you needed to sign and email a document to someone, you had to print out the file, sign it with a pen, and then scan that printed document back into the computer. And let’s face it, many Windows and Mac users still do the print & sign & scan routine, particularly those who are not aware that the signature feature is included in Mac OS X! The next time you need to sign something? Just use your trackpad, or if you’re not running the latest versions of Mac OS X, use the camera to scan a signature instead, both are easy and work very well. Remember, the ability to sign a document using your trackpad on the Mac requires a modern release of Mac OS, anything beyond 10.10 system software will have this feature in Preview for Mac. Thanks for the tip. How do you blur part of the PDFs/photos using Preview ? Preview does not include blur tools at the moment, but you could draw a color filled box over a particular area to block out a part of an image. Otherwise, a free app like Skitch includes a simple blur/pixelate tool that can be drawn over part of a photo, and of course more advanced apps like Pixelmator and Photoshop offer complex blurring tools as well. Thans Paul for the reply. I just installed Skitch yesterday since I could not find that on Preview. what? sign your life away. mark of the beast. the end is nigh bro. Very cool tip(s) – thanks! But speaking of tips, the one on top of my biro isn’t recognised by the trackpad, nor the rubber on the top of my mechanical pencil. Is there anything other than my finger tip that the trackpad on my MacBook Air will respond to? I’m not so flash at signing with my finger! Pretty much any tablet stylus will do the job. Thanks for the tip, Pan Gantz! We used this tip two years ago when we closed on our house, but did a remote closing from another state. All 90 pages of closing documents were e-mailed to us and we were told we needed to sign or initial each page. No way was I going to print, sign, and scan each page. It was off to Google where I found OS X Daily. Signed each page electronically and e-mailed back within a few minutes. Awesome! Does anyone know how to copy the signature to another Yosemite Mac? I’ve got a rMBP and want to copy the signature to a MacPro (without trackpad). I tried the old trick with keychain but no luck. I’m also pretty sure I had a signature on the MacPro but post update it got deleted. One little problem with this: the drawing starts as soon as you’ve clicked inside the box (as per part 4 of the instructions), so what happens if you don’t want to start your signature inside the box? It would have made much more sense if some key press started the drawing, so you could get the pointer in the right place to start off. Further to the above, with a bit of experimenting I’ve figured out the correct way to draw the signatures. The trick is to picture the trackpad as a piece of paper on which you are drawing your signature, and then place your finger in the appropriate place before you start to draw. You will not get any feedback from the screen till you begin drawing. It might be good to include this advice in the instructions, and maybe to make a video also. And, contrary to a suggestion made elsewhere, you _can_ raise your finger and move it to another place to continue, just as you would raise your pen when writing on paper — the line does not have to be continuous. Nope- the toolbox / briefcase looking icon is greyed out. Can Macbook Air (2015) do this? 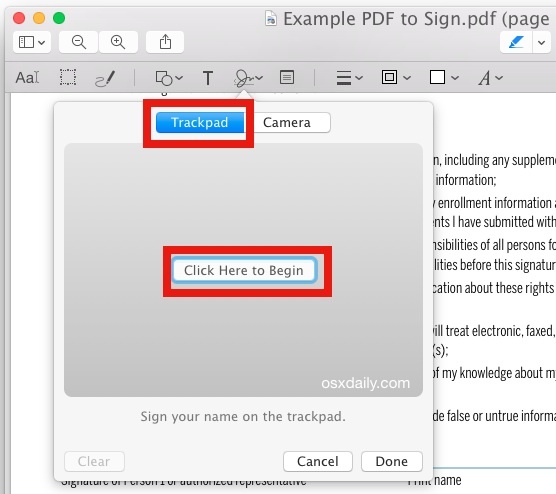 Yes, all Macs can do this to sign documents with the trackpad, with a modern version of OS X the feature is available. OK, I opened preview, and I can see the briefcase icon, but when I click on it, nothing happens. What am I missing? Clicking the briefcase / toolbox icon in Preview will reveal the toolbar. You can also go to the “View” menu and choose “Show Markup Bar” to reveal the same toolbar with the document signing options. I have OSx El Capitan 10.11.6 and I cannot use the briefcase icon, but can capture a signature using the Tools menu item, Annotate. But in capturing the signature, I end up with a “Manage Signature” box, with the signature in it, but cannot then transfer it to the document. Try opening a different new document, unrelated to the original PDF, and see if you can access the toolbar in that. The toolbar will pop up directly underneath the toolbox icon in the same general area at the top of the document screen. The toolbar and the editing features within it are a major feature of Preview so it is available in all versions. I wonder if you have some preference issue, a reboot may help as well for some quirky behavior. So, I tried a PDF file, and it worked perfectly. Does that mean that a WORD document just can’t be signed? 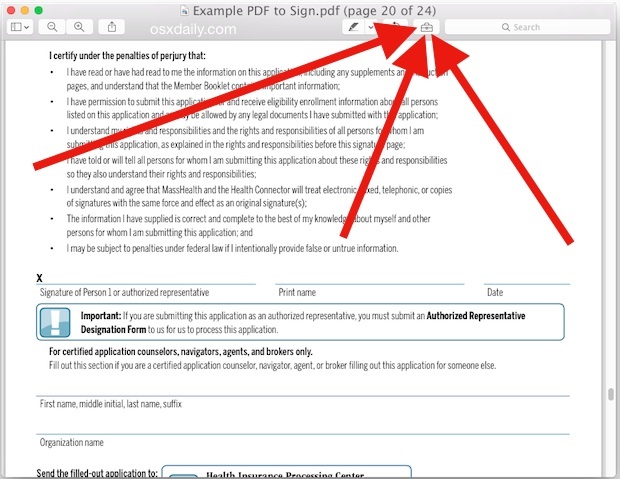 Preview on the Mac will only sign image or PDF documents that can be opened in Preview app. You could sign the Word document but first you would need to convert the Word document to PDF, then import that PDF into Preview to sign it. Kind of complicated in that situation, but in short; yes you can sign any PDF file with Preview, you just must convert the document to PDF first.